Orange Cake Mix - "Red Rose Speedway"
Orange Cake Mix is a solo project by Connecticut-based musician James Rao. I'd never heard of Orange Cake Mix, but looking at the web site I see that Rao has been a busy boy having released numerous CD's, cassettes, and vinyl on many different labels. The music on "Red Rose Speedway" is very well done lo-fi pop, much of which has a floating ethereal quality, and some being damn good pop-psychedelia. It kind of has a 60's folky psychedelic sound to it. It doesn't take a quality recording to show your stuff when you excel at solid melodies and Rao knows how to write simple but enjoyable pop tunes. Among the standouts are the title track which introduces us to Rao's lulling ethereal vocal style. "Believing In You" and "Mayfair Towers" are excellent examples of catchy melodies and cool 60's ba-dap-ba'-ba' kitch. And "Lo-Fi Love" may well be the best pop song I've heard in 30 years! (Certainly the most fun.) I mean it. I can just hear this done up properly in a multi-million dollar studio. This song alone is worth the price of admission. 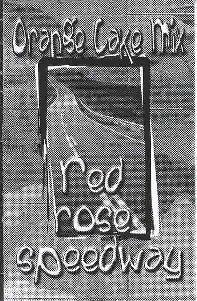 But despite the lo-fi nature of the recording there is some very good music on "Red Rose Speedway" too. "Without A Trace" has an aggressive sound, but still has a floating psychedelic quality. A hint of the Beatles trippier moments perhaps. "Space Medley" is a trippyyyyyyyy series of tracks with lulling acoustic guitars, bleeping synths, ethereal vocals, and cosmic samples. A lo-fi song journey in space. "Silver Phoenix" is a spacey melodic instrumental with freaky looped bits. And "Morning Star" features an interesting Robert Fripp guitar sound. In summary, Orange Cake Mix should appeal to anyone who appreciates the poppiest of pop from the 60's, done up nicely in a homemade music element. I'll have to check out Mr Rao's other releases. The Orange Cake Mix cassette is distributed by Best Kept Secret, a cassette-only label in Italy that focuses on homemade musicians. For more information you can visit the Best Kept Secret web site. You can also visit Orange Cake Mix at their web site.